Schistosoma mansoni is a digenean trematode with a complex life cycle developing successively in two different hosts. Infection occurs when cercariae (1 see figure below), are released into water by Biomphalaria sp. snails to search for and to penetrate the skin of a final human host. Within the skin, cercariae transform into schistosomula (2), which enter capillaries and lymphatic vessels. Schistosomula pass through the lungs and the heart, and reach the portal venous system of the liver where pairing occurs. 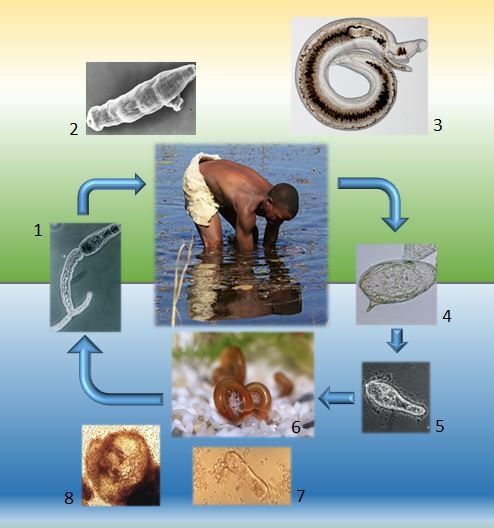 Schistosomes continue their transformation in sexually mature male and female worms and finally migrate as paired adult worms to their final habitat in the mesenteric veins (3). Male adult worms form a ventral groove, the gynaecophoric canal, in which the longer and thinner female resides during a constant pairing contact. This close contact is a prerequisite for sexual maturation and subsequent egg production and it can last for years or even decades. Paired females produce non-embryonated eggs, which penetrate with the aid of lytic enzyme secretion through the wall of the veins and migrate to the intestinal lumen of the host. During migration, embryogenesis processes generate a multicellular larva inside the egg, termed the miracidium. Embryonated eggs are released with the faeces (4) and following contact with water and stimulation by light the miracidium hatches from the egg (5) and actively seeks its suitable intermediate freshwater snail host (6). After penetration, the miracidium transforms into a primary sporocyst (7). By asexual reproduction, daughter sporocysts are generated within the snaiĺ digestive gland (8). Daughter sporocysts finally develop cercariae (1), which represent the only infective stage for vertebrate hosts.